Join Westshore Lambda GSA for their first meeting of the seemster! Everyone is welcome and we hope to see you there! Finals causing you stress? 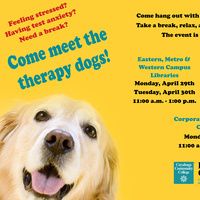 Get some relief by spending time with therapy dogs! Thinking of attending Cleveland State University, come meet and speak with a representative outside the Transfer Center. Come out and play bingo with us and win some prizes!! !